“Come over here and help us!” [Sermon Notes on 1 Thessalonians, Week 1] | Open Our Eyes, Lord! We know this, because this is what the apostle Paul experienced when he went to Thessalonica, one of his three stops in Macedonia. We read that Paul had a vision that seems to come through a dream. This was not God calling Paul to be a missionary; he had already been one for at least 15 years. The vision was to lead him and the team – at this point consisting of Paul, Silas, Timothy, Luke, maybe others – from one region to another, to spread the gospel where it had not yet gone. Acts 16:6-9 And they went through the region of Phrygia and Galatia, having been forbidden by the Holy Spirit to speak the word in Asia. [the text does not say how, but I imagine it was by some supernatural revelation] And when they had come up to Mysia, they attempted to go into Bithynia, but the Spirit of Jesus did not allow them. So, passing by Mysia, they went down to Troas. Think of a tube of toothpaste, and the Spirit was squeezing them along to the farthest west, until there wasn’t any dry land anymore! They stopped at the seaport of Troas, which is not far from ancient Troy. We will pay attention to a couple of points of grammar in this section = first, these two underlined verbs are singular = You, Paul! Come over and help us! When Paul woke up this dream was pressing heavily on his heart, and he told the other members of his team. Acts 16:10-12 – After Paul had seen the vision, we got ready at once to leave for Macedonia, concluding that God had called us to preach the gospel to them. From Troas we put out to sea and sailed straight for Samothrace, and the next day we went on to Neapolis. From there we traveled to Philippi, a Roman colony and the leading city of that district of Macedonia. And we stayed there several days. That is, they bought passage on a ship and sailed westward. 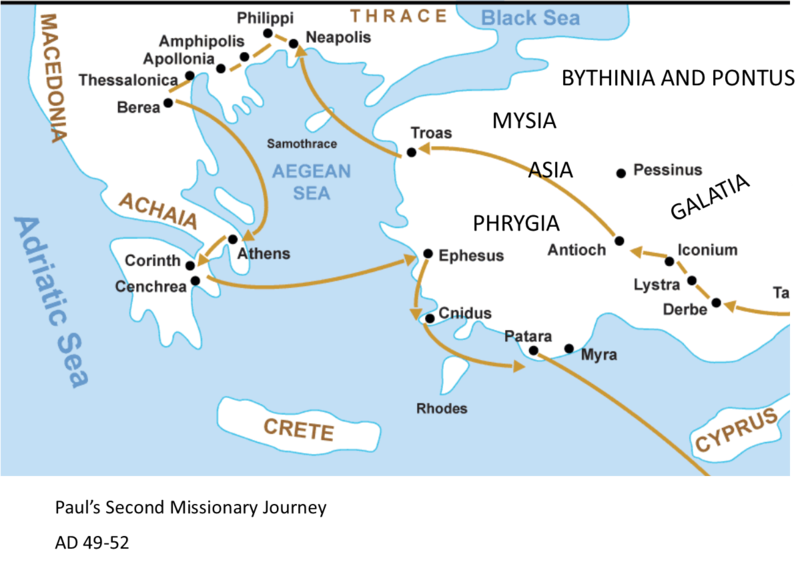 It was a two-day sail from Troas to a port called Neapolis in Macedonia, and then they walked to Philippi. But please, let’s put an asterisk next to this other point of grammar, where it changes from the third person (he, they), to the first person plural (we, us) – “we sought to go into Macedonia, concluding that” or “because we decided [as the GNB] that God had called us to preach the gospel to them”. Do you see what I’m emphasizing here? Paul had a vision, and afterward all the members of the team made the decision to go. They all interpreted what the Macedonian man meant; and so they set sail. SO – they have a good team, divine message, and a specific call of God. They naturally concluded: Let’s go share the gospel in Macedonia! Obviously we are going to see a massive revival, because the Macedonians are just desperate for us to come and tell them about Jesus! First Stop, Philippi: there wasn’t even a synagogue, which was unusual for that part of the world, so Paul meets with some women who believed in Jehovah God. Lydia is converted to the gospel along with her household = family members and workers in the family business. Paul casts a demon out of a slave-girl who was a fortune-teller. Paul and Silas are taken before the city rulers, who have them beaten, and brutally. You know the story of how God sent an earthquake, and the jailer and his household were converted. Paul, Silas and Timothy left, there’s a clue in Acts 16 that they left Luke behind to work with the new Christians. Second Stop, Thessalonica. Read 17:1-9 – They walk to Thessalonica. This time opposition came from the Jewish leaders in the city, who rounded up some people and caused a riot. The city government made Jason, a new Christian, post a bond, a large amount of money that he would forfeit if there was any more trouble with the Christians. So Paul and Silas go to the next town, Berea, it’s not clear what Timothy does for now. Acts 17:11-12 – Now the Berean Jews were of more noble character than those in Thessalonica, for they received the message with great eagerness and examined the Scriptures every day to see if what Paul said was true. As a result, many of them believed, as did also a number of prominent Greek women and many Greek men. Well, isn’t this just excellent! This is more like it. So the Macedonian Man really does want us to go and help them! Acts 16:13 – But when the Jews in Thessalonica learned that Paul was preaching the word of God at Berea, some of them went there too, agitating the crowds and stirring them up. The believers immediately sent Paul to the coast, but Silas and Timothy stayed at Berea. Those who escorted Paul brought him to Athens [probably by ship] and then left with instructions for Silas and Timothy to join him as soon as possible. This was getting to be monotonous, a cycle of Paul and his team preaching the gospel, Paul encountering opposition, Paul being beaten or driven out, Paul moving southward. The team consisted of at least four people at the beginning, and it ended up with Paul leaving Macedonia by himself. For the next weeks we will be studying 1 Thessalonians, and here is the context in which it was written. Paul had left Macedonia and communication had been cut off between him and Thessalonica; he was afraid that the persecution had been so ferocious that maybe the church had been wiped out. Let’s go to the center of the letter, which we have to read first if we are going to understand this epistle. 1 Thess 2:17-3:6 – But, brothers and sisters, when we were orphaned by being separated from you for a short time (in person, not in thought), out of our intense longing we made every effort to see you. For we wanted to come to you—certainly I, Paul, did, again and again—but Satan blocked our way [remember that]. For what is our hope, our joy, or the crown in which we will glory in the presence of our Lord Jesus when he comes? Is it not you? Indeed, you are our glory and joy. 3:1 So when we could stand it no longer, we thought it best to be left by ourselves in Athens. We sent Timothy, who is our brother and co-worker in God’s service in spreading the gospel of Christ, to strengthen and encourage you in your faith, so that no one would be unsettled by these trials. For you know quite well that we are destined for them. In fact, when we were with you, we kept telling you that we would be persecuted. And it turned out that way, as you well know. For this reason, when I could stand it no longer, I sent to find out about your faith [this is a trip that Timothy took, it was about 2 weeks to walk to Thessalonica and back]. I was afraid that in some way the tempter had tempted you and that our labors might have been in vain. But Timothy has just now come to us from you and has brought good news about your faith and love. He has told us that you always have pleasant memories of us and that you long to see us, just as we also long to see you. Therefore, brothers and sisters, in all our distress and persecution we were encouraged about you because of your faith. For now we really live, since you are standing firm in the Lord. How can we thank God enough for you in return for all the joy we have in the presence of our God because of you? Night and day we pray most earnestly that we may see you again and supply what is lacking in your faith. Given all this excellent news, 1 Thessalonians is a letter that just drips with feelings of relief, and joy, and gratitude. But this wonderful news would come only later. 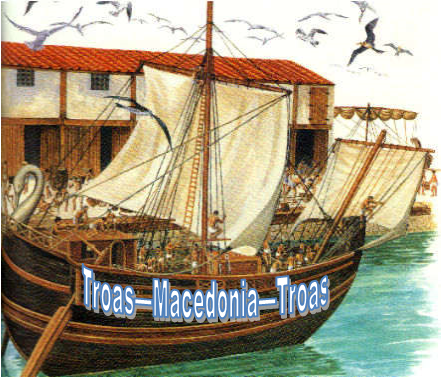 For now, let’s go back earlier, to Troas, where they bought their tickets and are sailing to Macedonia. If we were there with Paul, and we had experienced this vision of someone begging us, “Come over here and help us!” and we had sailed from Troas to Macedonia, what would we have expected? Might we have expected that, At least there will be a Welcoming Committee of Macedonians to meet us at the pier? In our imagination we picture them saying, Pardon me, are you the missionaries?? Thank you so much for coming over here to help us!! Now, what is your message, we’ve been waiting and waiting! Instead they saw a small amount of gratitude and receptiveness, starting with Lydia; and a measure of furious opposition; but most notably, they ran into a huge amount of indifference and apathy. When they arrived, the typical Macedonian Man didn’t seem to be waiting for them to show up. The Macedonian Man was satisfied with his life and had zero interest in this new “good news”, or whatever that little Jewish man was calling it. So on the one hand, Paul had this vision, but then the team experienced plenty of evidence God hadn’t really called them to Macedonia: persecution, violence, illegal beating by the Roman government, new Christians who now suffer hardships that they never had before they met Paul, rejection by his fellow Jews in two cities. The four-man missionary dwindles to three, two and one and Paul is alone, tossed out of Macedonia. Perhaps the heaviest burden to bear was that “Satan blocked us!” (1 Thess 2:18). Paul knew the book of Job, and so he knew that if Satan had blocked them, it was because God had given Satan permission to do so. If they read the evidence a certain way, then apparently they were in the wrong place at the wrong time. When we looked over Acts 16, I asked you to remember a little piece of information; the morning after Paul’s vision we went to Macedonia, “because we decided [as the GNB] that God had called us to preach the gospel to them”. If had been me, after PTB (Paul Takes a Beating) it would have occurred to me to say, Okay, but in the dream did Jesus actually anywhere appear to say, “Go to Macedonia!” Did any of them say, You know…WE decoded the dream to mean that we should sail to Macedonia; we deduced that it was God’s will. Was this whole Macedonia Mission based on our misinterpretation? Or was Paul’s vision merely a normal dream, since we happened to be at the very seaport where there are signs that say, “Boats to Macedonia”? And yet: despite the great hardship, it turns out that, the higher truth was that in Philippi, Thessalonica and Berea, Paul was thoroughly blessed and a wonderful, supernatural blessing to others. It’s right there in the book of Acts and in Paul’s letters, that they planted thriving, joyful, evangelistic churches in Macedonia! In his three epistles to Macedonia (1-2 Thessalonians, 10 years later, Philippians); references to Macedonia in other epistles, there is confirmation after confirmation that God had worked in Macedonia during those few months, and that the dream that Paul had that night was most definitely an authentic message from God. Now, Luke, the companion of Paul, is traditionally thought to be the author of Luke and Acts, and that he joined the team in Troas – it’s where he says “we decided”. I accept this viewpoint. And the fact that Luke, the author of Acts included it, shows that he thought that the vision was a word from the Lord. Let’s stop there for today. For when we study Scripture, we take into account the history of God’s work, but if we are not asking God to mold us, and obeying him, we are not really reading the Bible as it was meant to be read – we will either be changed by the Word of God, or we will start changing it to suit us. In Paul’s case, Macedonia was a pioneer mission field, there were no churches. On the other hand, Costa Rica has a large Christian presence, but it is still a mission field. (I, a missionary, came here to work, as did many of my friends). Some of you grew up here, some moved here. And it is clear that God wants us to share the gospel – we need no scary vision in the night to tells us that! So what do we do with this phrase, right here, right now – Come over here and help us! What is our “over here”? For me, much of my evangelism happens on the internet – on Mondays, Wednesdays, and Fridays, I click a button and go. For example, this week, I got in touch with H____, who just received the Lord, and J____, who isn’t a believer but wants to know more about the Jesus. This is all in Spanish, so I dialogue with people from all over Latin America. So for me, “come over here” might be “come to the internet, three times a week”. Or come to speak to someone driving a cab; or on the street. Evangelism is not just for young people, so I know that I too am required to share the faith. Ask the Spirit to help you fill in the blanks: What is the gospel HELP you are currently giving to others? And what is the HELP you could give out? Benediction: Gracious Lord, you have called your church to take the gospel to all of the 195 nations of the earth. Teach us too to bring the good news of Jesus to this place in this time, that all may come to a saving knowledge of you. Amen. or just type “Thessalonians” in the search box. Tack så mycket, Keijo, many blessings.